I’ve been staying at Marriott hotels a lot recently. Just in the past year alone, for example, I’ve stayed at the Marriott St. Kitts, the JW Marriott Hong Kong, the Marriott In-Terminal Hotel Calgary Airport, the Ritz-Carlton, Bali, and the JW Marriott Bangkok. Even as I plan my upcoming trips, Marriott is the first place I look in terms of redeeming points for hotels. Today, I paused for a second to ask myself why. And what I realized was that Marriott Rewards has recently emerged as the ideal hotel rewards program for Canadian travellers – and it has done so almost by accident. You see, we Canadians haven’t had much joy recently when it comes to hotel programs – Capital One discontinued their IHG card, the Hilton program continues to offer poor value even as a 1:1 transfer partner of American Express, and earning World of Hyatt points remains a difficult task. And while Best Western Rewards offers decent value here and there, it doesn’t really give you access to any luxurious properties. That left us with SPG and Marriott. SPG was historically the stronger program for Canadians, since you could earn points more easily using the American Express SPG Card and Business SPG Card, whereas the latter only had the Chase Marriott Visa (which has since been discontinued). You see, when the 1:3 transfer ratio was announced, that meant that all of a sudden it was just as easy to earn Marriott Rewards points as Starpoints. 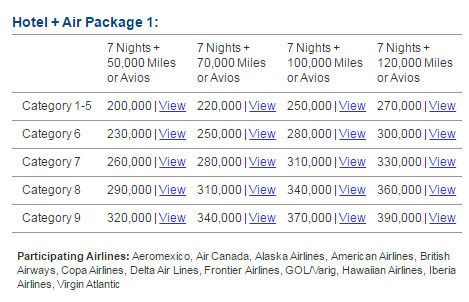 The American Express SPG Card signup bonus of 20,000 Starpoints was equivalent to 60,000 Marriott Rewards points. Same goes for the Business SPG Card. Moreover, since SPG was a 2:1 transfer partner of American Express, you could also earn points that way. The signup bonus on the American Express Business Platinum Card of 75,000 Membership Rewards points, for example, converted to 37,500 Starpoints. With the 1:3 transfer ratio, that’s a whopping 112,500 Marriott Rewards points from one credit card alone. When you look at it this way, you can see why the loss of the Chase Marriott Visa might not be so keenly felt! And that’s without mentioning the American Express Cobalt Card, which gave us yet another way to accumulate Marriott Rewards points by way of Starpoints, when it launched last September. The point is that Marriott’s takeover of Starwood and the 1:3 transfer ratio acted as a great equalizer between the two programs. SPG’s most significant advantage at the time – the ease of earning points – suddenly counted for nothing. In the rest of this post I’ll be highlighting the many circumstances in which Marriott Rewards is a whole lot more useful to Canadian travellers than SPG. Keep in mind that although the points are freely transferrable, the two programs remain separate and have different rules governing them, many of which are more favourable under Marriott Rewards. Chief among these, of course, are the redemption rates for hotels. I’ve covered this before in my Guide to Marriott Rewards, but essentially when redeeming for high-end hotels, the math works out to be much more favourable if you go for Marriott over SPG. Marriott’s top Category 9 hotels cost 45,000 points a night (equivalent to 15,000 Starpoints), while SPG’s Category 7 hotels are 35,000 Starpoints a night. Even Ritz-Carlton hotels, which go by a different redemption schedule, cost at most 70,000 Marriott Rewards points a night, lower than the equivalent amount required for top-tier SPG hotels. On the other end of the spectrum, SPG generally provides better value for lower-tier hotels. If you’re looking for a no-frills option for an overnight layover, SPG tends to be a better bet, but you should always do the math and double-check. Keep in mind that each program’s redemption rates were designed with their respective ease of earning points, as originally intended, in mind. In other words, you were never supposed to be able to earn 112,500 Marriott Rewards points with a single credit card! Only a particular twist of fate (i.e., Marriott acquiring Starwood) has now allowed us to combine SPG’s ease of earning points with Marriott’s favourable redemption chart for luxury hotels. Take advantage of this while you can! Before the Marriott–Starwood takeover was announced, few people bothered with the Travel Packages since it was really tough to earn so many Marriott Rewards points. But once the points became freely transferrable, this meant that you only needed 90,000 Starpoints to avail of a transfer package. In fact, redeeming a Travel Package became an even better value than transferring the Starpoints directly! Think about it: if you transferred 90,000 Starpoints directly, you’d get 110,000 airline miles, taking into account the 5,000 point bonus. If you redeemed 270,000 Marriott Rewards points for a Travel Package instead, you’d get at least 120,000 airline miles – meaning you’re already ahead – and on top of that you’d get seven free hotel nights. Even better, you can upgrade your 7-night certificates using points to any Category between 6 and 9 as well, so you aren’t limited to Category 1–5 hotels. Of course, staying at the same hotel for seven nights is more useful to certain types of travellers than others, but even if you stay only 4 or 5 nights using the certificate and let the rest “go to waste”, you’re still coming out ahead. The Marriott Travel Packages are one of the most outstanding value deals that exist at the moment. In my opinion, it’s a sweet spot that’s almost certain to be neutralized when the new program launches later in 2018 or in early 2019, so I’d highly recommend making the most of it while it’s around. In addition to freely transferrable points, another benefit that Marriott Rewards and SPG both wanted their members to enjoy was the ability to status match between the programs. Indeed, all SPG Gold Elite and Platinum Elite members were rewarded with equivalent status in Marriott Rewards, and vice versa. What’s funny is that a similar thing to what happened with the points also happened on the status side – in particular with the mid-tier Gold status. Marriott Gold Elite status is a lot more useful than SPG Gold Elite because of one additional benefit: executive lounge access and breakfast for two. If you’re staying at a Marriott hotel where there is an executive lounge as a Gold Elite member, you get to enjoy breakfast, evening hors-d’oeuvres, and all-day beverages in the lounge. If there’s no lounge, you get free breakfast in the restaurant. Staying at a Starwood property, on the other hand, would get you no such benefit. Prior to the merger, SPG Gold Elite status was a lot easier to earn than Marriott Gold Elite – all you needed to do was grab the American Express Platinum Card or the Business Platinum Card and you automatically got SPG Gold Elite as an added benefit. Post-merger, however, that translates into an instant and effortless Marriott Gold Elite designation as well. Doesn’t it almost feel too easy? One last thing I love about the Marriott Rewards program that often gets overlooked is the ability to book awards without having the points in your account. You can confirm hotel reservations even if you have absolutely zero points – you just need to earn the points prior to your stay. You can also cancel reservations for no charge up until a certain date (usually a few days to a week before your stay). This opens the door to making speculative bookings if you haven’t fully finalized your plans yet. Still trying to decide where to spend your summer holidays? Nail down your hotels among all your potential choices, then cancel the rest once you’ve decided on a place. Not sure whether you’ll be staying two, three, or four nights in a certain city? Book separate reservations for nights three and four, and cancel as needed. And when your travels take you places where hotel rooms are likely to fill up (such as New Year’s Eve in a big city, or going to a major sporting event), you can use this incredibly useful trick to lock down your hotels quickly and worry about the points later. For Canadian travellers looking to use their points on hotel stays, Marriott Rewards is absolutely on fire right now. The Marriott–Starwood merger really opened the door for us to start making the most of Marriott Rewards, since prior to that it was tough to earn a meaningful number of points in the program. Nowadays, with a stronger proposition than SPG in terms of redeeming points for luxury hotels, transferring points, elite status, and holding awards, Marriott Rewards is a program that every Canadian should be looking to maximize. But wherever there is outsized value for us travellers, there will eventually be a tendency to correct that imbalance. That’s why my guess is that a lot of these benefits will be “normalized” once the new program comes into play in the coming year or so – implying, of course, that we ought to do our best to take full advantage in the meantime.